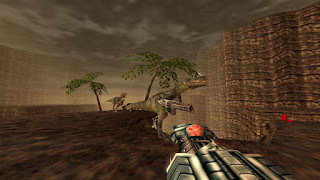 When it launched on N64 in 1997, Turok: Dinosaur Hunter was one of the first games that really made the case that first-person-shooter games could actually be viable on consoles. 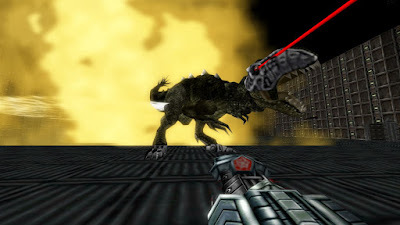 Of course, GoldenEye 007 took that ball and ran with it later that year, but Turok hit the scene first. 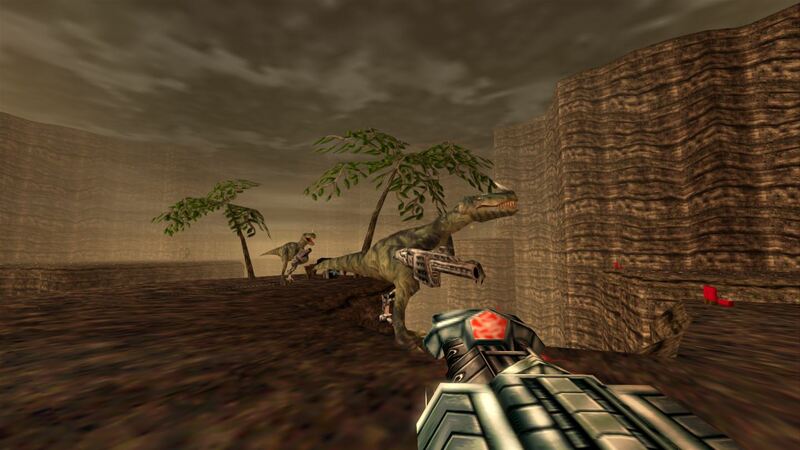 Now, 21-years later, the original Turok hits consoles again on Xbox One in a world where FPS games on consoles are massively successful and popular. Does it still hold up? Does it still look good? Yes and yes, absolutely. Turok: Dinosaur Hunter has never played or looked or performed better than it does on Xbox One and it is still a ton of fun. Continue reading our full review for all of the details. Pros: Great gameplay; graphics options; cheat codes; its still super fun! The first thing you need to know about this new Turok release on Xbox One is that it isn’t a remake, so don’t expect gorgeous modern day graphics. It was remastered with the intention of retaining the look and feel of the N64 original and in that regard they absolutely nailed it. It is nice and sharp and runs at modern day high resolutions, but the textures are simple and the character models are blocky polygonal N64 quality. It looks razor sharp and clean now and not muddy and ugly like the original game looks like if you try to play it today. It looks great. The more important thing about the visuals is that it runs at a rock solid 60-FPS, which is a huge, huge, huge improvement over the N64 original that ran at a much lower framerate. This remaster also offers some interesting graphical options as well that give you the choice to keep a more N64-like look or you can flip a few switches to change how it looks. You can keep the trademark N64 fog at its original distance (about three feet in front of your face) or you can push it further back. You can also turn on anti-aliasing, bloom, light scattering, change shadow detail, and more. I love having all of these options. I especially love the fact that you can adjust your field of view as well as turn off camera bob, head bob, etc. in case the game gives you motion sickness. I have to admit, it did make me motion sick-y a little at default settings, but turning off turn bob (where the view kind of leans as you turn) helped a lot. I’m also happy to say that all of the cheat codes from the N64 days return just like you remember them. Using them turns off achievements, which is somewhat of a bummer, but as long as you don’t care about that you can cheat to your heart’s content and have a great time. I’m somewhat ashamed (but not really) to admit I never really played these games legit back in the day. I always cheated, but how could I resist getting my hands on all of the weapons in the game, infinite ammo, big head mode, and other goofy and fun options that made the game better? Honestly, I miss cheat codes. I wish more games used them today. Cheating was fun as heck. As far as the core gameplay goes, Turok has never played better than it does on the Xbox One. The N64 controller was a game changer at the time, certainly, but it can’t compare to the modern dual analog controllers we have today. In the old days you moved with the “C” buttons and looked around with the analog stick on the N64, but on Xbox One it uses the modern day "move with left stick and look with right stick" controls. It feels good. In fact, it feels great. You can be much, much, much more precise with your movement and aiming in this version, which really elevates the gameplay. Something you have to remember about this remaster is that FPS games in 1997 were quite different than they are today. The levels are huge and sprawling in Turok and progression is gated behind exploring every inch of a level to find a bunch of keys to unlock the next level. It is not a linear bland boring follow the leader game like most FPS campaigns are these days. Likewise, ammo is hard to come by and your health doesn’t automatically recharge. You have to scrounge for ammo and collect health power ups to stay alive. This is oldschool gameplay at its finest and it is glorious. The other thing you need to know about Turok is that shooting stuff is incredibly fun. You have a huge arsenal of weapons that starts off with a simple bow and arrow but quickly ramps up to a pistol, shotgun, rifle, minigun, rocket launcher, and even a nuke among many others. Shooting stuff feels really nice, too, as enemies actually react accordingly based on where you shoot them. The game is also really bloody and gory as blood squirts out of wounds and enemies die in gruesome death animations. The physics add a lot of goofy fun to the game as well as enemies fly through the air (screaming) from explosions, which is always hilarious. 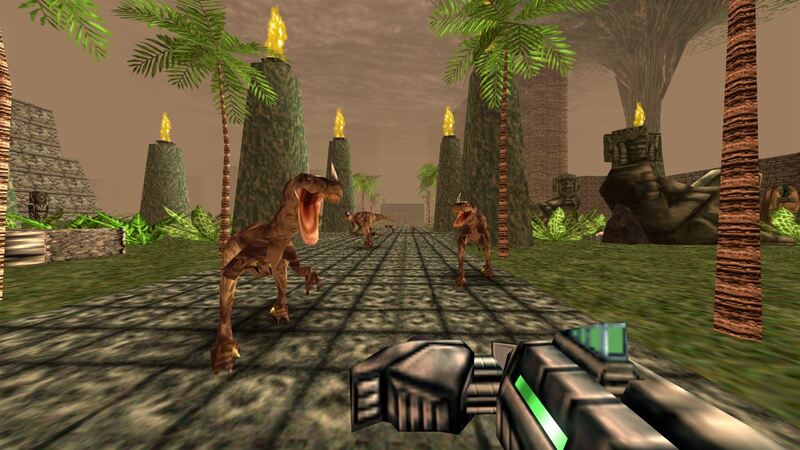 Bottom line, Turok is still loads of fun to play even today. All in all, I’m super happy with how this Turok remaster has turned out on Xbox One. The game still looks and feels like an oldschool N64 game, but also has modern features that clean the visuals up quite a bit and the game plays awesome with an Xbox One controller. I think some people will balk at the $20 price point, but this game is a solid 8-10 hours long and has great replay value thanks to the cheats as well as simply how fun it is to explore the levels and shoot stuff. Turok is awesome and still holds up great even 21 years later. Buy it.